* Polartec® Power Stretch® with Hardface® Technology - 88% polyester, 12% elastane, 230 g/m². A four-way stretch fabric that allows for excellent athletic movement and good breathability to maintain comfort. Some products feature Hardface® Technology for a higher level of abrasion resistance. 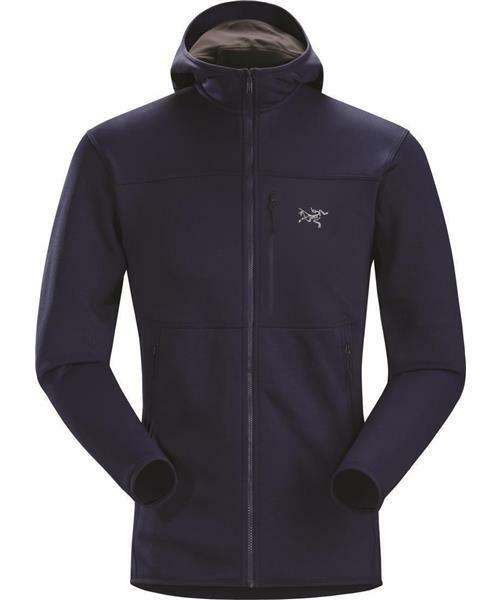 Fortrez Hoody - Mens is rated 4.2 out of 5 by 29. Rated 4 out of 5 by Steve from Great mid layer Recently purchased this jacket as I really liked it when I saw it in store. This is great for frigid weather as an outer. I've yet to test it in extreme cold, but I believe it'll be a great midlayer. I really like the fact it has a hidden snood built in to the hood. This will cover the neck area, & when needed cover mouth & nose. This is a great feature. I give this 4.5 out of 5. It would be a 5 if they had a hem draw cord - to help seal in the heat. I'm pretty tall & the XXL fits great. little bit extra in the sleeve, but not an issue (& most of my Arcteryx jackets have long sleeves - maybe I'm the issue?). Overall, great jacket & I'm pleased with the purchase. Rated 5 out of 5 by jack from Badass jacket Take your best shot. It won't faze the Fortrez. I've been wearing this jacket literally non stop for the past week, sticking my arms in cracks this jacket has no business being in, arm-barring, hand jamming, and generally just beating the living daylights out of this it. Barely a thread out of place. I literally wake up, put this jacket on, and don't take it off until I hit my sleeping bag at night. I don't notice it on the approach, climb or the hike out. THAT is when you know a jacket is excellent. Rated 5 out of 5 by Jimmy from Extremely Durable The exterior material looks really good up close, better than in the pictures online. Kind of a 3-d checkered pattern. I doubt anyone can make a fleece that is more resistant to pill/abrasion, mine looks like the day i bought it. It's actually a bit water-resistant so I have worn it in light rain and it didn't soak up water. I wear it hiking and have worn it on its own in slightly below freezing temperatures with a phase SV base layer and i wasn't too cold, it definitely keeps you very warm. breathable too, but just don't use this on a hot day, cool/cold weather only. I'm 6'0" 200 lbs, I wear a large and it fits well. The built-in balaclava face-guard actually came in useful on super cold days. It has a sport fit, not baggy but not skin-tight. Rated 4 out of 5 by MiamiJAG from Like it very much but... I wish the color description would be more accurate, I was expecting a black jacket with grey breast pocket and bright red zipper and details, but in reality the jacket Nighthawk is blueish with bright orange details. So it wouldn't hurt to name it Nighthawk Blue and orange on the description. It happened also with a running shirt, I was expecting a blueish color and it arrived greenish. So if the pictures online change the color, please add a more descriptive info about the product. Other than that I like my "blue" jacket, fits great and excellent quality. Rated 2 out of 5 by Wren from Needs Revision I was very excited to try out the Fortrez hoody but had to walk away from it. 1. The main zipper has trouble zipping up when it gets to the neck. At first I thought it was me but then I realized it need an extra finger to guide the unkinking of the fabric at that point. 2. For its purpose, the length should be at least a couple cm longer at the waist because it lifts too much when the arms are raised. I like the baklava idea but the design needs revision and so does the price of such a light fleece. Rated 3 out of 5 by DrDavid from Odd Fit I thought this would be a good piece of gear for me. The integral balaclava seemed a neat idea. I love Arc'teryx and have lots of their stuff but this one just didn't work. Sizing is sometimes a challenge, especially when ordering online. It helps if you have items in some of the different sizing styles so you can try to triangulate a possible fit; however, either I really blew it with this one or it's just odd. I think it's just odd. I'm 5'6'' and about 81kg: short and stocky; certainly not thin or long-limbed, but pretty solid. I ordered a large, which often works with their tighter, more athletic or slim fitting styles. This one here was quite tight on the arms, especially the forearms; it fit great around the chest and shoulders, but was overlarge on the torso and especially the stomach. It seemed to billow out on the lower end. I put it on and almost immediately took it off. I really wanted this piece to work but it was an odd cut. Given my frame and build a little more relaxed fit in the torso could actually be a good thing. Even still, one would have to be pretty hefty around the mid-drift for this to be a comfortable fit. I left on the tags and am going to sell it, hopefully recoup my losses and get something else…oh well, the risks of online ordering. While the Fortrez was a fail I'm a serious convert and have plenty of other Arc'teryx gear that works great for me. Rated 5 out of 5 by AbbasMir from Perfect Mid or Outer Layet Fabulous product, so versatile, irrespective of whether you are climbing, cycling, trekking or simply playing football in cold weather, this product fulfills all one's requirements.